I’ve had a huge battle since yesterday cloning my dead slow 1Tb HDD to a 120Gb SSD. Why? No, not because of the size difference, but because once I’d cloned the system drive from the HDD onto the SSD, Windows wouldn’t recognize the new SSD as a boot drive! I tried Googling to find out how to rectify the problem but only got half solutions, misinformation, and misleading, hard-to-follow fixes (no offence to the previous people who had posted them in good faith) which all resulted in dead ends. At this point, let me mention that you can clone your old HDD to a smaller SSD but only if the system files take up less space than the SSD. 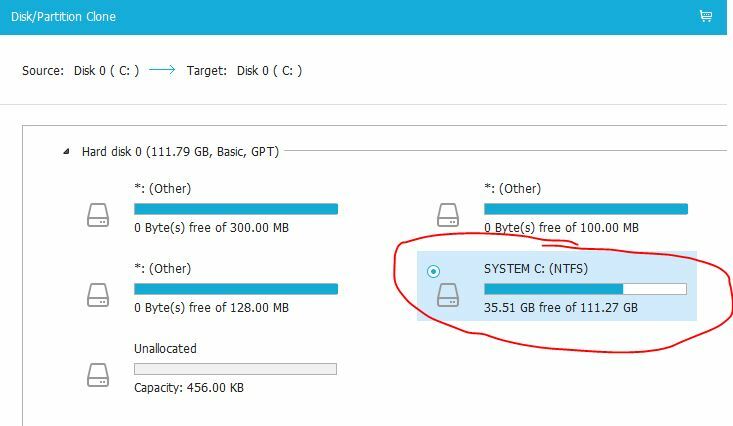 I know that seems obvious, but I’m just clarifying that because my 1Tb HDD had been partitioned, so the system drive (c:) was only about 80Gb, which is why I said it would fit on the new SSD. All my other files would have to be on an external hard drive, but let’s not get into that now. Oh, let’s go back another step and let me explain something else: The reason I wanted to clone my HDD to my SSD was to avoid having to reinstall all my programs and setting up my whole system again. So I tried using EaseUS Todo Backup Free 9.2 cloning software, which was the right way to go, but I was doing something wrong. 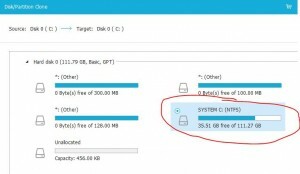 I had downloaded and installed EaseUS Todo Backup Free 9.2, hooked up my new SSD in an external case to the USB 3.0 port, and was following the instructions in the software to clone the existing HDD system drive to the SSD. Eventually, today, with my appetite for trial and error and my paitence-o-mometer hugely depleted, I suddently hit a mild eureka moment! What if I did a fresh install of Windows onto the SSD (to created a bootable disk) and then clone the old HDD’s system drive onto the new SSD’s system drive… basically overwrite it!!! How I arrived at this took, as I said, a lot of trial and error. But basically, I had realised that the old HDD had about three small 100Mb drives on it (that Windows makes by itself) and these weren’t being copied over onto my SSD when the cloning took place. So! That’s what I did… but not without first battling to get the laptop to boot off the Windows 8.1 DVD. To get the computer to boot off the Windows 8.1 DVD you need to hold down the F12 key to force the machine to allow you to choose the boot from DVD option. Well I hope I’ve kept your interest long enough, because I know I’ve rambled on a bit, but hopefully my problem above, when it’s indexed by Google, might help you to find the solution below. Yes there was method in my madness, so don’t flame me just yet. Step 1: Remove the existing HDD from your computer and install the SSD in its place. Step 2: Insert your Windows OS DVD into the DVD drive. Step 3: Turn on your machine and hit F2 if you need to select a boot device. Then hit F10 to save and exit. After the machine restarts, hold down the F12 key to force the machine to allow you to choose the boot from DVD option. Step 4: When the black screen says “Press any key to boot from CD/DVD”, press a key (yes any key). Step 5: Delete the existing partitions (if any) and create a new drive/partition. Install Windows on the SSD. It will create a bootable drive and a couple of other small drives (hidden in Windows Explorer). Step 6: Once Windows has finished installing (on a SSD it’s pretty quick – should be less than 30 minutes), power down and remove the SSD from the computer. Remove the Windows DVD too. Step 7: Install your HDD again and attach your SSD in the external drive case via USB to the computer. Step 8: Power up, and your existing HDD will load Windows. Step 9: Download and install EaseUS Todo Backup Free 9.2 cloning software on your existing HDD’s copy of Windows. Once installed, click run. Step 10. Using the cloning software, select the C: Drive on the HDD as the source, and click proceed. Select the largest drive on your SSD as the destination and click ‘Clone’. The software will run the cloning process which should last about 30 minutes (depending on the size of your system drive). Step 11: Once the cloning is finished, shut down your computer, remove the HDD and insert the SSD. Power up. Step 12: Windows will now attempt to repair the installation. Follow this process, and within less than a minute you should load into your original version of Windows on your SSD! Congratulations! If you followed this closely you should hopefully have been successful! If you have any comments or queries, reply below… you may get help, and/or you may just help someone else! This entry was posted in Tutorials and tagged clone, cloning, EaseUS Todo, error, hard disk drive, hdd, No Bootable Device, plett, plettenberg bay, software, solid state drive, solution, solved, ssd on Nov 29, 2016 by admin.